This is beary wonderful! I love the bear sandwich! Looks like a yummy lunch! Lisa-sometimes cheesy is a very good thing:) Happy Monday! Your boys have a wonderful mom. This is such a nice idea... they will remember these things down the road for sure. You are so unbelievably creative. I love reading these Monday posts! Great lunch and perfect with the title of your whole blog! I want that cutie pie sandwich! My kids would dig that. Well done Lisa. Love the bear sandwich. So cute. Pierce has good taste. I like teddy grahams too... I just can't eat them anymore. too cute! worth the blush! Very Cute! I love how you put the m&ms in the cookie cutter!! You always make the most creative lunches! I usually just take 2 pieces of bread and slap some PB & J on them and scream "Lunch time!" Maybe my kids would be more excited about lunch if I was more creative like you!! 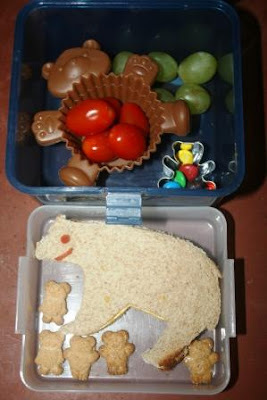 You always make me wish my g'kids lived right next door so I could fix your cute lunches for them! You must have so much fun dreaming them up. Sounds yummy. I love the baby teddy grahams around the big bear sandwich. I also love that you used a bear cookie cutter to put the M&Ms in. So cute. How cute is that? I wish I had lunch like that! Kids have it made these days. I'm just back and catching up after a much longer than intended absence. I love your park pictures. And your Gilbert rooster is cracking me up!!!! I believe he had been the voice of the Aflack Duck and made some awful statement that got him fired. So the duck lost his voice during the new hiring process. Let's hope Gilbert doesn't move to Virginia! Your lunches are just so cute. I always smile reading about what you prepare. Love the bear, Lisa... I'm sure that Pierce loved it too...Great lunch!!!! Who cares about the cheese factor, this really is super adorable! Now that is one cute lunch! Love the muffin tin - thought it was chocolate. I love the bear sandwich!!! I bet Pierce loved his lunch that day!!! So cute! Love that cookie cutter! I bet that lunch 'bearly' lasted a minute!